Lawrence Wendell Jarmon obituary. Carnes Funeral Home. 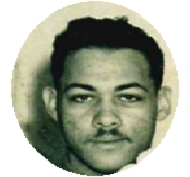 Lawrence Wendell Jarmon was born in a home in Houston, Texas on September 6, 1930 to parents Samuel and Mildred Jarmon. He was the third of four sons born to this union. Lawrence was reared in San Antonio, Texas and educated in the public schools. He graduated from Phyllis Wheatley High School (San Antonio) in 1949. He served in the United States Army during the Korean War, honorably discharged at the rank of Corporal in 1953. He moved to Houston at the behest of his older brother, Wesley. He was confirmed in the Episcopal Church at St. James’, Houston. He attended Texas Southern University briefly before embarking on a career in the restaurant hospitality industry. He worked at the Coronado Club, an exclusive dining club in downtown Houston as head waiter and Maître d’. He retired after 40 years of service. Lawrence was affectionately called by his middle name, Wendell, by family and close friends. He was exceptionally handy and could fix/repair just about everything. He led a simple and unobtrusive life. He enjoyed watching television – sports and news broadcasts and eating cold cut sandwiches. He also enjoyed reading. He would read every section of the Houston Chronicle and oh, the magazines!! He subscribed to over 25 magazines and read every issue of each one. Lawrence transitioned peacefully in his sleep after a long illness. May his soul rest in Eternal Peace. He is preceded in death by his parents and brothers. He leaves to cherish his memory his wife of 24 years, Betty; children – W. Jeanine (Barry) Wilkins; Karen (Ravey D) Wesley; Cedric (LaCrescia) Lloyd; Juanita Harris; Michael Lloyd; Justin Wilkerson; and Sylvia Wilkerson; and a host of grandchildren, nieces, nephews, and other relatives. Homegoing services will be on Thursday, January 25, 2018 at Carnes Funeral Home located at 1102 Indiana, City of South Houston 77587. Viewing is at 10:00am. Funeral at 11:00am. A repast will follow the service at 12:30pm at St. James’ Episcopal Church located at 3129 Southmore Boulevard, Houston 77004. The family thanks you for your prayers and support. Your kindness will always be remembered.